Plastic, cosmetic, reconstructive, and other providers are struggling to gain their hold in their respective market territory. Elective care patients are weighing their decisions against factors like affordability, convenience, and benefits which is making things even more competitive. A large part of the research to learn about different treatment options, providers, cost, maintenance, etc., is happening on the internet. Providers who are showing up with more authority across different online platforms are catching everyone’s attention and inevitably, obtaining more new patients. 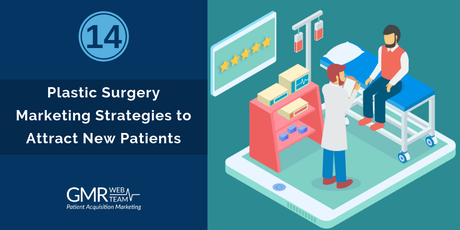 In this post, we’ll share some plastic surgery marketing strategies that will help you stay ahead of the competition and increase your share of new patient acquisitions. Your ideal prospective patients are those who are mature and affluent enough to invest time, money, and efforts to receive your services. The best platform to target them is Facebook. Targeting options on Facebook go beyond just demographics. Annual income level, relationship status, dating interests, shopping behaviors, interests in beauty and related products, activities and purchases are some of the many other options that you can leverage. Not just Facebook, Google Ads also allows for targeting potential users based on different parameters, including their income level. Your previous (happy) patients are a great source of new referrals; and their word-of-mouth advertising is more effective compared to any other option. However, you’ll need to consistently feed them with something new about your practice or service, which they can share with others. Staying connected with them through email newsletters, social media, and texts is a great way to keep them aware of the latest offerings and achievements of your practice. That way, they’ll always have something on their mind about you to include in their chats and conversations. In cases where it’s mostly the wrong expectations resulting in unhappiness, communication with the patient is the key for long-lasting relationships. Offer a free appointment via text or phone call. Educate them on the used procedure, and show them some previous results to help them understand the reality. An even better option is to let them know about the exact results beforehand, so as to avoid any possibility of the wrong expectations. How? Read the next strategy. Many potential clients, because of their fear of a botched surgery, back off even after taking a consultation. The best way to ease that fear is to show them what exactly they’ll look like after the surgery. This will totally eliminate the possibility of a situation caused by wrong expectations. With technologies like Adobe Photoshop, it’s as simple as taking a picture of the to-be-altered body part and manipulating it on a computer in front of your patient’s eyes. Visually being able to see the results will put them into a completely different mindset and they would feel confident to take the surgery. No matter where potential patients hear about you, they’ll search online and eventually land on your website to learn more. It’s crucial that your website is effective enough to persuade visitors to take actions. It should be visually and layout-wise non-confusing and logical, and it should convey your value proposition. Before and after images, patient testimonials, and any mentions of individual awards and certifications are the other things that your plastic surgery website should prominently display. One of your main goals is to appear on the first page of searches when people in your area look for your services online. Searches like “best plastic surgeon near me,” “top nose job specialist in [your city name],” etc., generally indicate strong purchasing intent and that’s why getting traffic for these is extremely valuable. You can easily rank for those keywords with local search optimization (SEO) strategies such as local directory listings of your site, maintaining NAP (name, address, and phone number) consistency, adding location pages to your site, creating local content, online reviews, local link building, social media community management, etc. Local search organic ranking methods, as given above, are an excellent way for long-term benefits; but, you can’t always wait for the organic methods to show the results. That’s where Google’s Pay-Per-Click (PPC) comes into the picture. PPC is where you bid on Google Ads’ auction system to place your ads for relevant and high intent local search terms. Your budget and the placement of your ad will depend on the competition. With PPC, you get complete control over your site’s local search ranking. If your website is the vehicle, content is the wheels that help it drive it to its target audience. Publishing relevant, educative, and engaging branded content is a great way to improve your site’s chances of ranking for keywords in searches. It also helps in building your brand as an expert in plastic/cosmetic surgery. Create a blog page on your site and post useful and relevant content such as blog posts, case summaries, infographics, and videos. Always try to target relevant keywords in your blog posts. Try gaining more exposure with content outreach opportunities and distributing your content through various social media platforms. Prospective plastic surgery patients generally do not convert on the first visit on your website. By the time they are ready—after having considered other options—they may have already forgotten you. With Remarketing, you can keep yourself on top of their mind during their entire research phase. A cookie or pixel (a piece of code) is stored on their system through their browser when they visit your website, which allows you to display ads (including the Facebook ads) on any site they access from the same browser for a defined period. Reviews play a significant role in your prospective patients’ decision-making process. That’s why you need to gather as many reviews as possible. If your service is top notch, you’ll receive mostly positive reviews that will add to your reputation. However, as no one is perfect, you may receive a few negative reviews which can be disastrous for your online reputation. Employing an online reputation management (ORM) solution can help you efficiently manage every aspect related to online reviews—collecting them, directing them to review sites, responding to them, and even analyzing them to learn different aspects about your service and the overall patient experience. Patients trust reviews as equally as personal recommendations, so why not amplify their reach to the maximum number of patients? Select some of the rave reviews and sprinkle them as testimonial quotes throughout your website. You can also use relevant quotes in marketing campaigns for specific procedures. Moreover, you should also create a testimonial page on your site and regularly update it with positive reviews, especially those which mention specific value points about your practice. Those words will be added up to the weighted pages, and as the testimonial page will be indexed regularly by Google, it will also help in your search rankings. Having a way to listen to social media conversations is crucial as it lets you keep track of general patient opinion and learn about your areas of improvement. Those learnings can be utilized for different purposes, like creating more value-centric ad campaigns and making needed changes in staff behavior and clinic culture. One of the best ways to listen to social media conversations is by using social analytics tools like Netbase. These tools use Natural Language Processing (NLP) to analyze social conversations. Their intuitive reports and charts help you understand the prevalent public opinion about your brand, and let you compare it (your brand) with your competitors. Facebook’s highly-sophisticated advertising engine lets you narrow down your audience by specifying a number of targeting options. Why not use this feature to identify themes that are not directly related to plastic surgery, but are useful (in some way) to its target audience? For example, mothers of children who play soccer may be interested in learning about sports-injuries related topics like protection from sun exposure, the effect of dehydration on the skin, non-surgical fat-reduction, and early-stage treatments and procedures, etc. By catching their attention with high-interest informative pieces of content, you can establish yourself as a credible source of information and build a fruitful relationship with them. Video is the hottest form of content online. By 2021, 80% of internet traffic will be coming from videos. Most of the video content will be consumed through social media platforms and YouTube. This calls for increasing the budget spend on videos in your social media marketing strategy. Patient testimonial videos, short explanatory videos about a procedure, and candid videos of the staff are some of the highest performing forms where you need to invest your time, money, and efforts. The time to expand your practice is now! Just relying on your superior procedures to get more patients cannot guarantee growth anymore; especially, when there are others in your vicinity who are promising the same or maybe even better service. You’ll need to catch your prospective patients’ attention. Follow the Plastic Surgery Marketing strategies given above to stay ahead of your competitors. If you are looking for experts to help you in new patient acquisition, give us a call at 800-523-7187.